Laura Schwindel wanted the Quad and only the Quad for the visual display protesting Planned Parenthood Sept. 30. The Students for Life president said the university Scheduling Services pushed for the event, entailing pink crosses, banners and handouts, to be held in the designated Free Speech Zone between the UC and the Orr Center. Reactors took to social media to express confusion over university policy on event locations. The Free Speech Zone allows outside speakers or groups not authorized by the university to speak or set up displays on campus. Eddie Rodriguez supported the Students For Life’s use of the Quad on Facebook. Senior social work major Katie Richardson commented on a previous story by The Shield that she was upset about this organization using the Quad while others have been delegated to the Free Speech Zone. Marcia Kiessling, associate provost for Student Affairs, said the Free Speech Zone is for speakers not affiliated with the university or a recognized campus organization. She said there would be no reason to deny a group rights to the Quad, given the group is not disrupting campus activity or property. Freshman Gabi Baker said she did her best to avoid the Students for Life’s pink display, but felt the task was nearly impossible. Freshman Mariah Winne said while walking to her dorm after classes, she couldn’t help but resent the display every time she passed it. Senior Jordan Taber commented on The Shield’s previous article that some of the Students for Life were pushy in getting people to accept their handouts. The display hosted by Students for Life travels the nation and visits college campuses to expose “lies” Planned Parenthood tells the public, said Students for Life of America regional coordinator Anna Held. 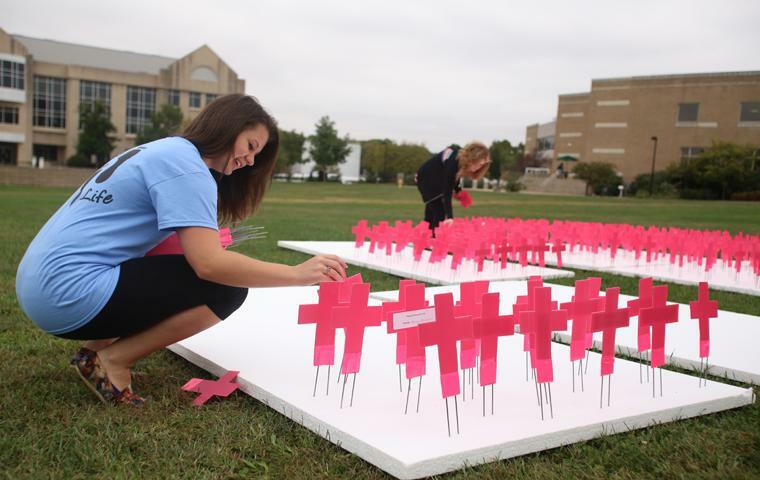 The pink crosses on the Quad reflected those 897 daily abortions, calculated from the Planned Parenthood annual report for 2013. Nationally, Planned Parenthood and the subject of its abortions and alleged fetus harvesting are under the media’s microscope through videos and statistics. The videos, which portray Planned Parenthood as secretly selling body parts of fetuses, sparked debate over how accurate the information is. Some people question the validity of the video evidence and if the footage is heavily edited. No matter what students are protesting and where they do it, Brandon Adams commented on Facebook that every event is essentially the same. Because if you don’t stay up on current events you fall into a repeatable pattern of ignorance. You know what’s really crappy about this is that several years ago a student group tried to do a project where they placed pinwheels on campus representing the 1 in 4 students (based on current estimates) at USI that are estimated to suffer from mental health issues. They were relegated to a location no one visited because pinwheels can apparently “damage” the sprinkler system. Something that could have been really moving and eye opening was completely ignored. Certainly more deserving of Quad space than a political/religious statement made on false grounds. But this crap gets it because some entitled kids complain about it on Facebook/Twitter. Super disappointed in USI right now.